Dare to race in traffic? Speed down a road with ever increasing traffic. Avoid all cars and signs and try to get as far as possible. Higher speeds increases the bonus but how long can you go on without breaking? ARE YOU SKILLED ENOUGH TO BEAT THE ONLINE HIGH SCORE? Traffic Race 3D just reached 1.7 Million downloads with great reviews! Give it a try its free! I'm proud to report that Traffic Race 3D has been downloaded 1.4 Million times! Thank you all for the support! Version 1.0 is finally available in the marketplace for download! I started this project in late 2011 and it has taken longer than expected to complete it. I've learnt a lot during this period about the Windows Phone Platform and also 3D programming. I would also like to thank everyone for their support, currently Traffic Race 3D is rated in the top 30 of free games on the Windows Phone Marketplace and I could not have done this without you. So from the bottom of my heart thank you! This is how the game looked in it's different stages Alpha, Beta and Release. - Bonus multiplier takes a bit longer to reach now. - Fixed AI bugs (disappearing cars). 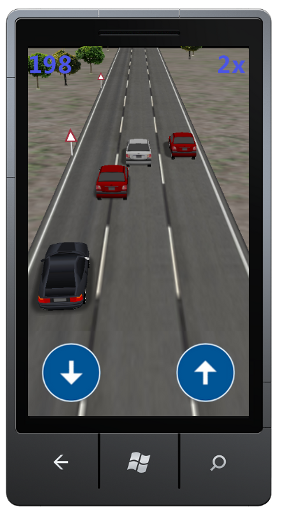 - Added indicator when AI is changing lanes. - Added more crash protection if corrupt data is downloaded. - Added crash protection when trying to browse to other games with poor internet connection. - Added MS Pub Center as another Ad provider (not activated yet). - Added crash stack trace collector. - Added workaround for delays when starting a game. (More info available on my site). - Added vibrate on/off setting. - Added feature to push system Alerts to users in case of major bugs etc. - Fixed off-road turn exploit bug. Go to games and uninstall the game and then reinstall it from the marketplace. Voila no more crashes! Another reported solution is to go to the marketplace again and search for Traffic Race 3D and then press update again! I have not the tested the last solution myself. Sorry for any inconvenience but I still do not know what causes this problem. - Added feature to retry upload of new high scores if internet fails. - Fixed possible crash in Hall of Fame High Score system due to partial downloaded high scores. - Fixed issue with very large scores. I have received several crash reports in regards to high scores and a fix for this has been sent to Microsoft for certification. Should be available in a week or so in the marketplace. - Prevented phone from locking during game play. - Added slider to adjust accelerometer sensitivity. - Increased max speed of player car slightly. - Vibrates device when crashing. - Added Admob as Ad provider. - Added Asteroid Lander to Free Game List. - Added system to respond on feedback from users. 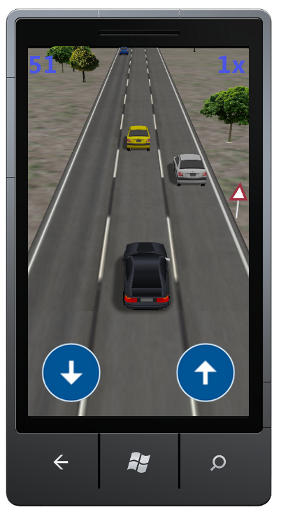 I'm proud to announce that Traffic Race 3D for Windows Phone 7 is now available on the marketplace. 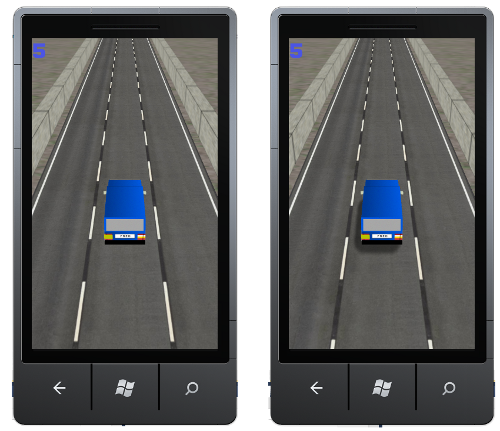 I've been working on several solutions to improve the performance of Traffic Race 3D for Windows Phone and now I think that I've found a good mix between performance and acceptable graphics. This means that I'm now able to run the game at 29 fps with per pixel lightning enabled. Check out the difference of the cars. I've been busy working on improving the graphics in the game and just a little change like adding fake shadows makes a big difference. As promised here is the first alpha video of Traffic race. The work with Traffic race has taken longer than expected but the game is making steady progress. The game is soon approaching alpha phase and I will soon post some videos. 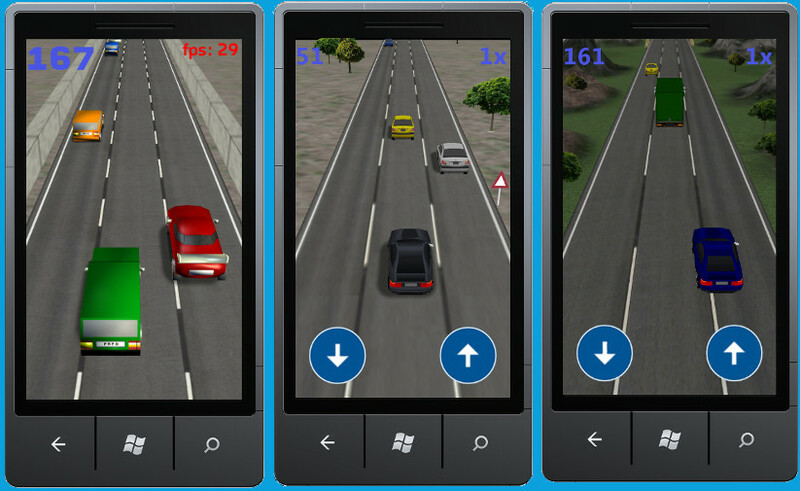 I've started a new project Traffic Race for Windows Phone 7 (WP7). Imagine that you are in a traffic jam and need to get through it as fast as possible.The game is a racing game in dense traffic. Copyright 2010-2013 Casual Games. All Rights Reserved.